Daily Light Integral or DLI are the total amount of photons in the PAR (400-700 nm) range that land on a target point over the course of a day. Meeting proper DLI requirements has a big impact on a plant’s root and flower development. Different types of plants require different DLI levels and have different photoperiods so check out some excellent research on the subject done by the Purdue Extension for various greenhouse crops here. 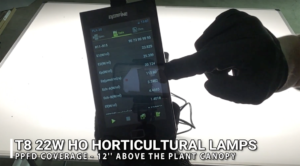 In horticulture applications a PAR meter can be used to take light readings at the plant canopy and get PPFD (μmol·m-2·s-1) data. The PPFD data can be inputed into the calculator above to get the corresponding DLI (mol·m-2·d-1) result over a certain photoperiod for that particular point. Active Grow provides detailed PPFD data at various hanging heights for its products to help users determine their potential DLI output.